BLICK BASSY is the new soul voice of Cameroon — soul in the sense of vocals that come from within. Bassy says: “The soul of my music isn’t so much in the words, it’s in the way of singing. In fact, the melody almost dictates the words.” On his debut album Léman, the singer / songwriter / guitarist / percussionist connects the music of Central and West Africa and mixes it with bossa nova, jazz and soul. Bassy’s guitar playing is effortlessly intoxicating, his soft voice framed by the kora, calabash and a double bass. The result is a unique, haunting sound which is velvety and subtly harmonic, yet also raw and rhythmic. 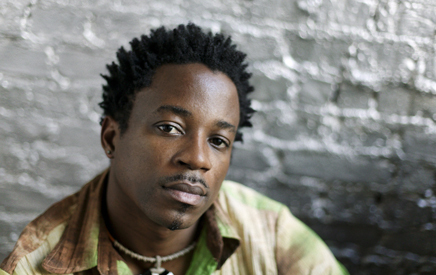 Blick Bassy started his first band, Jazz Crew, when he was 17. Playing a fusion of African melodies, jazz and bossa nova, Jazz Crew quickly became the most sought-after group in the city. In 1996, he formed a new band called Macase. During almost 10 fruitful years Macase released two acclaimed albums, Etam (1999) and Doulou (2003), as well as picking up various regional and international awards, including the RFI Prize for World Music (2001), Best Group by MASA (2001), and Best New African Group by the KORA Awards (2003). 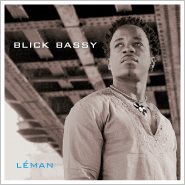 In 2005 Bassy decided to leave Macase, moving to Paris where he soon found work with Manu Dibango, Cheikh Tidiane Seck, Lokua Kanza and Etienne Mbappé. A few years later he signed to the World Connection label and began work on his solo debut.